Ever wonder what is inside that dark tunnel or deserted structure you pass on your way to work every day? There are a vast number of spooky and surreal abandoned buildings that populate even the densest countries, states and cities. Organized into helpful categories here are thirty must-bookmark resources for would-be urban explorers around the world, from urbex forums to photo sites and more. In addition to those listed below (right-click on the screenshots to jump), sites like DarkRoastedBlend and LookAtThis have entire categories dedicated to abandoned places and vehicles also worth exploring, and check oo our complete collection of Urban Exploration Tips, Tricks and Guides. Abandoned Factory above via Noctophotographer on Flickr. Opacity is a great place to start developing a taste for the allure of abandonments. Tom Kirsch, the site’s creator and primary photographer, has traveled the world photographing deserted buildings. Some of the images are enhanced and retouched for effect and the results are very compelling. Not all of the locations are named to protect the integrity of the abandonments but for visual inspiration the site is unparalleled. 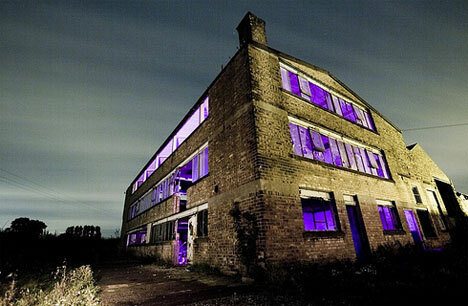 Infiltration is one of the oldest and most respected urban exploration websites around. The site’s founder has since passed away but back issues of their zine are still available for purchase as well as images and stories from past explorations and on-site forums. The site’s creator also wrote one of the definitive books on urban exploration – purchase at your own risk! 28 Days Later is definitely one of the most active urban exploration forums on the web and is focused mainly on British building infiltration. Explorations are divided into category by building type including tall structures, military installations, recreational facilities, underground sites and international (non-UK) sites. Many explorers upload stories as well as images of their adventures at various urban and rural locations. UER is another very useful urbex forum that is structured somewhat differently from 28 Days Later. There is a single dedicated section for photography with other sections relating to tools and tutorials, new urban explorers, general urban exploration information and terms and locations related to urbex. Best of all: UER has threads based on geographical location to help people connect and share urbex info regionally. Flickr has many collectives dedicated to different kinds of abandonment imagery, including the above-linked Urban Abandonments group. The group consists of over 200 members and over 2,000 images and shows a broad range of photographic possibilities in color as well as black-and-white, retouched and shot as-is, that demonstrate the various approaches different explorers take to shooting their subjects. Wikipedia is of course a good place to start looking for information on many subjects but has a particularly well-rounded article on urban exploration. A number of useful books are listed as well as the appearances of abandonments in prominent films and television. Also included are links to related subjects like caving, parkour and ghost towns as well as various urbex categories like draining and exploring active buildings. Europe: Urban Travel has an incredibly well-organized database of their adventures in building infiltration and photography from all over mainland Europe at dozens of locations. You can browse by building type or country and dig back through years of archived images. This is definitely a site to visit and revisit. There is also a very active Flickr group dedicated to European Urban Exploration. United Kingdom: Urbex UK has been featured in a number of national and international publications as an outstanding collection of urban explorations and building infiltrations that feature rich images, stories and other background information including maps and building plans. Australia: Sleepy City is an ever-evolving collection of one man’s adventures in urban exploration around the world but in particular his encounters with interesting abandonments in his home country of Australia. His main focus is on buildings but he also covers abandoned cars, subways, sewers, bridges and more. Russia: Abandoned dot RU features very raw, rough-and-ready images from various unfinished and abandoned building sites located around Russia. There is little attempt to glorify or even explain these ruins – viewers are given a full tour and it is at visitor discretion to assess the meaning of each location.